Dentures Don't Have to Look Like "False Teeth"! Dentures Don’t Have to Look Like Traditional “False Teeth”! Patients can now look forward to getting natural-looking dentures that don’t look like traditional false teeth! Gone are the days when dentures look like fake teeth. Experienced dentists can now create beautiful, healthy-looking dentures that enhance your facial appearance. Actually, there are a few types of dentures offered, and they all have attractive aesthetic qualities. Conventional dentures can be placed within 8-12 weeks after teeth have been extracted, whereas immediate dentures are fabricated beforehand so they can be placed in position shortly after the teeth are removed. Each type of denture has pros and cons, though. There are times when the results can look fake, and patients may be left with the “sunken-in” appearance (when the lower part of the face looks collapsed) that is characteristic of some denture-wearers. This type of denture can be removed when needed. A partial fills in the gaps where missing teeth were located, and it also prevents other teeth from moving. The pink-colored base is attached to a metal base that holds the denture into place in your mouth. Partials are sometimes chosen when one or more teeth remain in the lower and upper jaw. Economy dentures tend to be the most cost-effective type of denture. They are the most generic form of denture, which means that they do not sit comfortably or securely in your mouth. Patients who choose economy dentures typically wear denture adhesive to secure the fit as much as possible. Economy dentures tend to look fake when the patient wears them, too. Rest assured, we are skilled at creating natural-looking dentures that don’t look like traditional false teeth! Gone are the days when patients have to look like they have fake teeth; instead, the technology has advanced. 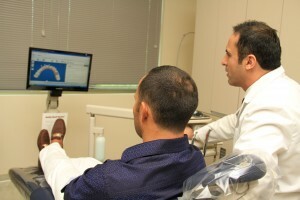 Our dentists stay ahead of the technology curve to use the latest, most advanced dental techniques. That way, you and your family can feel confident in getting top-notch dentistry services from our dentists in Fairfax, VA. If you or a family member need to restore your missing teeth, dentures are a viable option. With dentures, patients can look forward to a long-lasting, durable solution to missing teeth problems.